Today is day four (already!). Petra, Xanne, Sarah, Iman, Sahar, and I wake up to a very lekker breakfast of traditional Lukoma bread prepared for us by Bardha’s wonderful Mum. Lukomas are basically the bread version of what one would imagine a cloud to taste like, all fluffy, warm (well maybe not so warm in the sky but you get the gist) and soft to the touch – we also get to eat these later in the evening, but this time, with powdered sugar and chocolate paste. On this note, I would like to take the opportunity in this blogpost to say thank you to our host family, who have made us feel incredibly welcome, well-taken care of, and at home. After our breakfast, we board the bus to head to The Ideas Partnership, an incredibly inspirational non-governmental initiative founded in 2009 with the aim to respond to the needs of the Roma, Ashkali, and Egyptian community in Fushë Kosova. The initiative responds to the needs of the community primarily by working alongside the community to improve the venues of education, health-care, and economic development. Walking into the community center, we are greeted warmly by several of the volunteers, teachers, and community leaders who take us upstairs to meet the students, all sitting in their chairs with smiling faces. In the course of the morning, one girl sneaks a coy smile over to Suz and Louise, Rayan and Bardha talk football with two boys, Lisa sings head, shoulder’s, knees, and toes with another girl, and Shambhavi, Xanne, and several girls play with the camera. The initiative involves various projects that not only include education, but also provide maternity care classes for the mothers of the children, and work with individuals of all ages to promote the importance of education as the key to community development. This experience was unique to the whole ten days here, and unfortunately, was one of the only times this community was discussed as many of the international organizations we talked to hardly discussed how they were engaging with the community to improve their access to opportunities and adequate living standards. We leave only an hour and a half later, feeling strange to have walked into this space and left so quickly, without offering any sort of support except through buying several tote bags and lavender sachets. In the bus to our next stop, my mind tries to process everything, and I find it difficult to do so not only today, but the previous few days as well. I try to remind myself of trusting the process and it feels like we are always shifting gears with no time for reflection in between, and I am struggling to adapt to that, but I will indeed trust the process, and see where it takes me. After we got to spend some time, albeit too little, at the Ideas Partnership, it was already time to get back on the bus and head towards what Anne and Erik described as a “very strange place” for lunch, otherwise known as Restaurant Anija Janjevë. It is some sort of a theme park, but also not really, with an Eiffel tower that Rayan raises his eyebrows at, a beach of some sort, and a little body of water with a pirate ship. We have a lot of fun posing amidst the different monuments (see photos below) and sit down together to all have lunch (food is a big theme of this trip so far, – especially the coffee and Greek salad!). It is indeed, a very strange place, mainly because of its location which seems quite isolated from any surrounding towns or villages, but also because it is a significant contrast to the Ideas Partnership, where we were, only a couple of hours ago. We don’t really talk too much about it, but I think everyone was feeling uncomfortable with the fact that we were just spending time with young students that are working extremely hard to pursue an education in a space that does not get much attention by the local municipalities or government for that matter, and that is largely excluded from society, and now we are sitting in this beautiful space with lots of amazing food in plates filled to the brim. 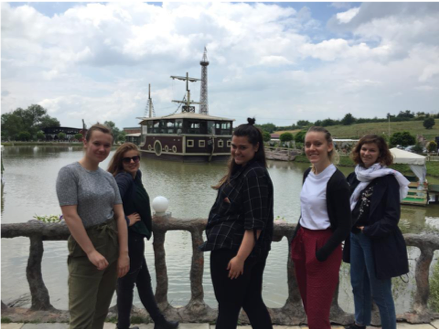 We end the day with a trip to the Gracanica monastery, which was really exciting to get to visit having read about it in our first week of Peace Lab and learning about Balkan history. The tour guide tells us all about its history and we walk around looking at the paintings and the art on the walls, some of which is slightly terrifying and some of which is incredibly beautiful and vivid with lots of colors. We head home afterwards to rest a little, and go for dinner together. Afterwards, we head to Club Zone. On the way there, Gjini Gjini becomes Suz, Louise, Rayan, and I’s favorite new song (listen to it, you won’t regret it!) that we hear on the cab ride there. Our group seems to be the only ones dancing, while everyone around us is nodding their heads (although we managed to get the groups of people around us dancing by the end of the night too). I’m excited to finally fall asleep towards the end of the night and ready for day 5, going to visit the beautiful city of Prizren!